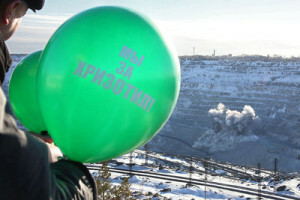 One hundred bright green balloons with the words «We’re for Chrysotile!» added color to the cloudless sky accompanied by the sound of «industrial fireworks,» or explosions in the quarry of the world’s largest Bazhenovsky field of chrysotile asbestos. This is how the recent 100-year anniversary of Uralasbest mine industrial complex trade union was celebrated. Residents of Asbest of the Sverdlovsk Region occasionally organize extraordinary public events to draw the attention of the public to issues in the chrysotile industry. On this particular March day, participants from the visiting session of the executive committee of the trade union of construction workers of Russia from Moscow, St. Petersburg, and Krasnodar and Samara Regions joined in the flash mob. Asbest residents (and the nucleus of the International Alliance of Chrysotile trade unions) have been defending the interests of the world chrysotile industry for over ten years in Geneva at sessions of the parties to the Rotterdam convention, where the lobbyists of substitute materials work to include this natural mineral in the list of prohibited dangerous chemical substances. Not without reason, these Ural activists find support not only from all four corners of Russia, but also in Kazakhstan, Kyrgyzstan, Brazil, Mexico, Canada, India, Cuba and other countries. There have been countless projects in the span of the anti-asbestos war, including scientific and medical investigations, excursions to the enterprises with the release of «secrets» on the working process, large-scale rallies in different countries, professional contests, marches, and motor rallies. To better express the idea of the desire to quietly work and raise their children without worrying about tomorrow to those who do not understand it, several public unions have been organized in Asbest, such as the Youth Union of the Chrysotile Industry, and the Women for Safe Labor and Social Stability movement. The association of veterans also united over 15 thousand people whose employment in the chrysotile industry is between 30-40 years.